Rubrics are scoring guides or specific pre-established performance criteria in which each level of performance is described to contrast it with performance at other levels. Provide feedback and grade student work. Help students understand the targets for their learning. Help students learn standards of quality for a particular assignment. Help students make dependable judgments about their own work that can inform improvement. There are two types of rubrics – analytic and holistic. 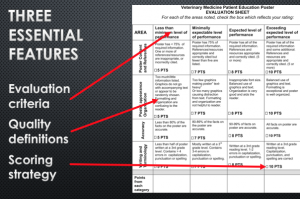 An analytic rubric is used to assess more than one content area at different levels of performance. A holistic rubric targets a single area and is used to assess a whole work or product considering multiple factors. 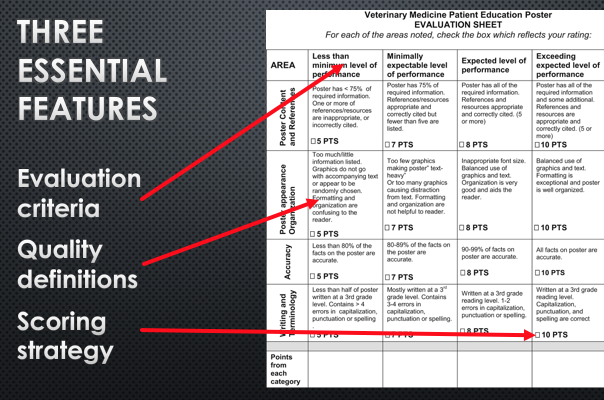 Rubrics contain three essential features: evaluation criteria, quality definitions, and a scoring strategy. They generally exist as tables comprising a description of the task being evaluated, row headings outlining the criteria being evaluated, column headings identifying the different levels of performance, and a description of the level of performance in the boxes of the table. When writing a rubric, an instructor or teaching team should set the scale, define the ratings, and develop descriptions of what performance looks like at each level. 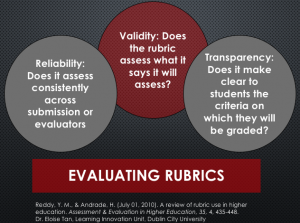 Studies of students’ responses to rubric use suggest that graduate and undergraduate students value rubrics because they clarify the targets for their work, allow them to regulate their progress, and make grades or marks transparent and fair. Rubrics enable them to engage in important processes, including identifying critical issues in an assignment and, thereby, reducing uncertainty and doing more meaningful work, determining the amount of effort needed for an assignment, evaluating their own performances in order to get immediate feedback, especially on weaknesses, estimating their grades prior to the submission of assignments and focusing their efforts so as to improve performance on subsequent assignments. Tip based on perceptions: Provide rubrics with the assignment description, as well as an example of a graded or evaluated work. In a review of 20 studies on rubrics, three studies report positive instructor perceptions of rubrics as scoring guides. In these cases, rubrics provided an objective basis for evaluation. One striking difference between students’ and instructors’ perceptions of rubric use is related to their perceptions of the purposes of rubrics. Students frequently referred to them as serving the purposes of learning and achievement, while instructors focused almost exclusively on the role of a rubric in quickly, objectively and accurately assigning grades. Instructors’ limited conception of the purpose of a rubric might contribute to their unwillingness to use them. Rubrics require quite a bit of time on the part of the instructor or teaching team to develop. The types of reliability that are most often considered in classroom assessment and in rubric development involve rater reliability. Reliability refers to the consistency of scores that are assigned by two independent raters (inter‐rater reliability) and by the same rater at different points in time (intra‐rater reliability). The literature most frequently recommends two approaches to inter‐rater reliability: consensus and consistency. While consensus (agreement) measures if raters assign the same score, consistency provides a measure of correlation between the scores of raters. Several studies have shown that rubrics can allow instructors and students to reliably assess performance. Of the four papers found that discuss the validity of the rubrics used in research, three focused on the appropriateness of the language and content of a rubric for the population of students being assessed. The language used in rubrics is considered to be one of the most challenging aspects of its design. As with any form of assessment, the clarity of the language in a rubric is a matter of validity because an ambiguous rubric cannot be accurately or consistently interpreted by instructors, students or scorers. Teaching tips from reliability research: Scorer training is the most important factor for achieving reliable and valid large scale assessments. Before using a rubric, a teaching team should practice grading assignments together to ensure rubric clarity. Reddy, Y. M., & Andrade, H. (July 01, 2010). 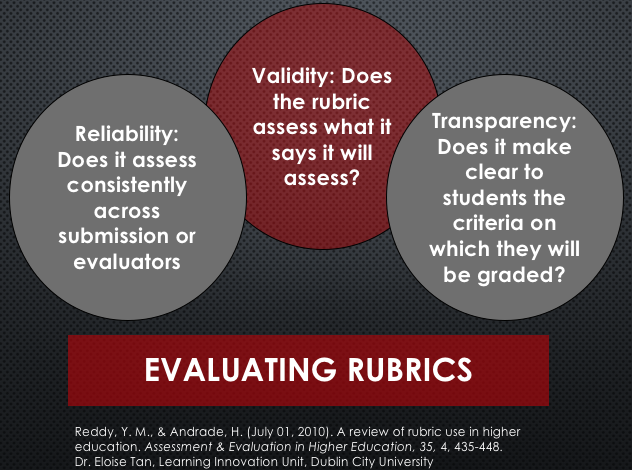 A review of rubric use in higher education. Assessment & Evaluation in Higher Education, 35, 4, 435-448. Base each item on an educational or instructional objective of the course, not trivial information. Try to write items in which there is one and only one correct or clearly best answer. The phrase that introduces the item (stem) should clearly state the problem. Test only a single idea in each item. Be sure wrong answer choices (distractors) are at least plausible. Incorporate common errors of students in distractors. The position of the correct answer should vary randomly from item to item. Include from three to five options for each item. The length of the response options should be about the same within each item (preferably short). There should be no grammatical clues to the correct answer. The response options should be indented and in column form. Avoid excessive use of negatives and/or double negatives. Avoid the excessive use of “All of the above” and “None of the above” in the response alternatives. In the case of “All of the above”, students only need to have partial information in order to answer the question. Students need to know that only two of the options are correct (in a four or more option question) to determine that “All of the above” is the correct answer choice. Conversely, students only need to eliminate one answer choice as implausible in order to eliminate “All of the above” as an answer choice. Similarly, with “None of the above”, when used as the correct answer choice, information is gained about students’ ability to detect incorrect answers. However, the item does not reveal if students know the correct answer to the question. From Writing Good Multiple Choice Questions by Dawn M. Zimmaro, Ph.D.
Rodriguez writes, “I would support this advice by contributing the concern that in most cases, only three are feasible. Based on this synthesis, MC items should consist of three options, one correct option and two plausible distractors. Using more options does little to improve item and test score statistics and typically results in implausible distractors. The role of distractor deletion method makes the argument stronger. Beyond the evidence, practical arguments continue to be persuasive. Less time is needed to prepare two plausible distractors than three or four distractors. More 3-option items can be administered per unit of time than 4- or 5-option items, potentially improving content coverage. The inclusion of additional high quality items per unit of time should improve test score reliability, providing additional validity-related evidence regarding the consistency of scores and score meaningfulness and usability. We may not feel comfortable moving from 4 or 5 options to 3, but the message is clear, there’s no reason to spend valuable faculty time and energy on developing non-plausible distractors, and more than 5 options does NOT improve a question. Incorporating frequent quizzes into a class’s structure may promote student learning. These quizzes can consist of short-answer or multiple-choice questions and can be administered online or face-to-face. … Providing students the opportunity for retrieval practice—and, ideally, providing feedback for the responses—will increase learning of targeted as well as related material. Providing “summary points” during a class encourages students to recall and articulate key elements of the class. Setting aside the last few minutes of a class to ask students to recall, articulate, and organize their memory of the content of the day’s class may provide significant benefits to their later memory of these topics. Whether this exercise is called a minute paper or the PUREMEM (pure memory, or practicing unassisted retrieval to enhance memory for essential material) approach, it may benefit student learning. … Pretesting students’ knowledge of a subject may prime them for learning. By pretesting students before a unit or even a day of instruction, an instructor may help alert students both to the types of questions that they need to be able to answer and the key concepts and facts they need to be alert to during study and instruction. Finally, instructors may be able to aid their students’ metacognitive abilities by sharing a synopsis of these observations. … Adding the potential benefits of pretesting may further empower students to take control of their own learning, such as by using example exams as primers for their learning rather than simply as pre-exam checks on their knowledge. Brame, C. J. & Biel, R., (2015). Test-enhanced learning: The potential for testing to promote greater learning in undergraduate science courses. Cell Biology Education—Life Sciences Education, 14 (Summer), 1-12. Make feedback timely and a regular occurrence. Begin the session with the learner’s self-assessment. Reinforce and correct observed behaviours. Confirm the learner’s understanding and facilitate acceptance. Conclude with an action plan. Reflect on your feedback skills. Make feedback part of institutional culture. Read the entire article by Ramani, S. and S. Krakov. (2012). “Twelve tips for giving feedback effectively in the clinical environment.” Medical Teacher. 34: 787–791. Q: I keep on hearing about assessment. Assessment as in a test, assessment as in learning outcomes, assessment as in course assessment, assessment as in program assessment. What’s up? A: The term, “assessment,” when commonly used at the college refers to a midterm or final exam, or another assignment designed to test for student acquisition of foundational knowledge or ability to clinically reason. In this sense, “assessment” serves as another word for examination. Assessment can also refer to a plan or structure established for constant course and program improvement, and a way to ensure a college is collectively doing what it says it does — that students learn what we say they will during their time with us. Because examinations are designed to test student knowledge, it would seem reasonable to equate the exam with learning outcomes achievement. This assumes that questions on examinations are aligned (directly related to) stated outcomes for a lecture or course or program. “There is often confusion over the difference between grades and learning assessment, with some believing that they are totally unrelated and others thinking they are one and the same. The truth is, it depends. Grades are often based on more than learning outcomes. Instructors’ grading criteria often include behaviors or activities that are not measures of learning outcomes, such as attendance, participation, improvement, or effort. Although these may be correlated with learning outcomes, and can be valued aspects of the course, typically they are not measures of learning outcomes themselves. What will the student’s work on the activity (multiple choice answers, essays, project, presentation, etc.) say about their level of competence on the targeted learning objectives? How will the instructor’s assessment of their work help guide students’ practice and improve the quality of their work? How will the assessment outcomes for the class guide teaching practice?